This group is a part of South West Scotland Area. Welcome to the Kilmarnock and Loudoun Ramblers group pages. We are based in East Ayrshire and have leader based walks to suit all ages and levels of fitness. So if you are near the Kilmarnock area and would like to walk with like minded friendly people then read on. Our walks vary from C grade flat short walks for those who prefer a more leisurely day out, to A+ long and high walks for the more experienced and fitter walkers. We also have walking weekends away. Plus social events throughout the year. You can check out this weeks walk on the This Weeks Walk page or check out our future programme by checking out our website where you can also view photos and video slideshows of a range of our walks plus a wealth of other information. The meeting point for all walks unless otherwise stated will be the car park of East Ayrshire Council offices at London Road, Kilmarnock at 8.50am to leave at 9.00am sharp. Please meet promptly, in order to arrange lifts for those without transport. Any different start times will be on the current programme, This Weeks Walk page, sidebar in website or Current Programme page. 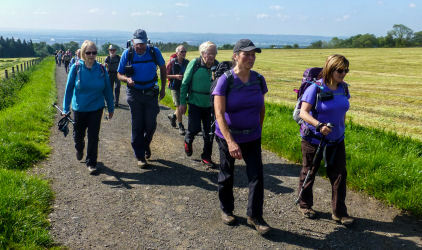 Join the Ramblers and become a member of Kilmarnock & Loudoun Group.